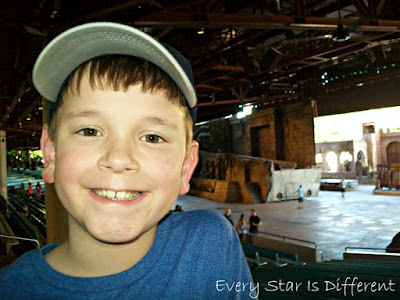 When I look back on our vacation the words Hollywood Studios Walt Disney and Special Needs make my stomach churn. Our day in this park was definitely filled with challenges. At the same time Dinomite and Bulldozer look back on this day with the fondest of memories and experiences. They can not wait to return to the park again. Our day at Hollywood Studios did not start out well. Bad news came the night before, right as the kiddos were getting ready for bed. More than anything else while at Disney World, Bulldozer wanted to be part of the Star Wars Jedi Training Academy. He wanted to meet Darth Vader. Bulldozer had talked about this for months and was so excited. We had planned to wake up early and arrive at Hollywood Studios before opening to ensure he could do this. Then, as I was speaking to the kind cast member who was helping me the night before, I learned that the Training Academy had just closed for refurbishment. The cast member even called to double check. The Walt Disney World website did not mention this. When we spoke to a reservation specialist a few days before we left, it wasn't mentioned. But now, the one thing that Bulldozer had planned on wasn't going to happen. He took it like a champ before bed, but the next morning he came into my room early, crawled in bed with me and cried. My heart broke for him. Thankfully he moved on quickly and we headed to Hollywood Studios. We had a fast pass scheduled for Toy Story Midway Mania first thing in the morning, which Bulldozer was also excited about. Sunshine on the other hand was not excited and was incredibly difficult to handle as we prepared for the ride. This was one of those times I was so thankful to have her stroller tagged as a wheelchair, and that we were able to load on to the ride in a separate handicap area. Her raging was not pleasant. I told her I'd stay with her, and that she didn't have to go. But then she didn't want to be left behind either. Sigh. Eventually we all did end up on the ride, only to make it around one corner before the ride stopped and broke. Sunshine was already screaming again at this point. Cast members had to come around and get us out of our cars, and we were told to leave as the ride closed. They did give us 6 tickets to come back later in case it was fixed, but... The damage was already done. Strike two for Bulldozer. On a more positive note, Sunshine was thrilled that the ride had stopped and she was able to get out. She does not like jerky motions, and this ride had a ton of them. Lunch at Pizza Planet was next on our list of things to do. We arrived early before it opened, so I was the first person in line, which was nice. Or so I thought. The only problem was, when they did open and we tried to order with special dietary needs, not only were the cast members not prepared, but they were not organized at all. They couldn't find our paper work. No one knew what they were doing. Dinomite and I waited in the restaurant, constantly asking for assistance for 90 MINUTES before our lunch was ordered. I was fuming. Dinomite was melting down. At one point, when someone finally did come to assist us I had to tell them to wait, because Dinomite could not wait any longer to go to the bathroom. 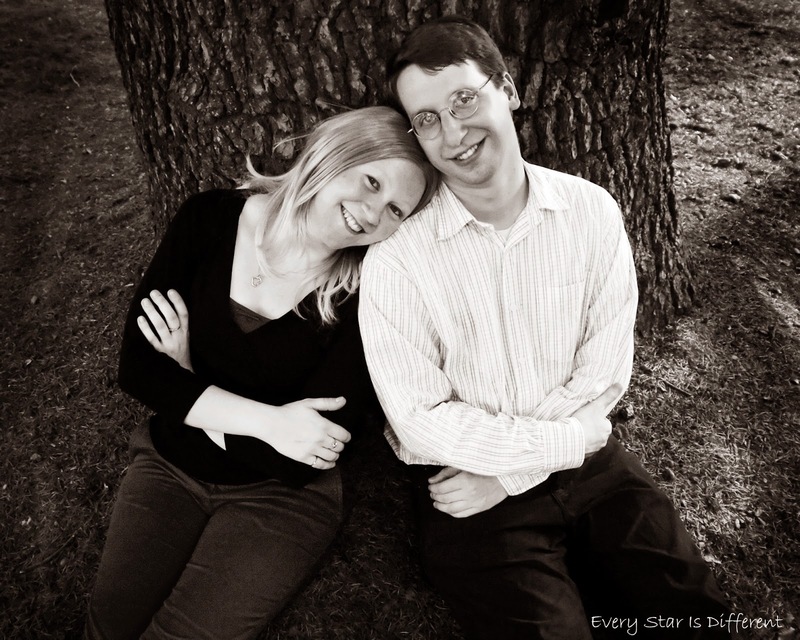 I couldn't imagine what life was like for Jason outside with the other three kiddos. At least they were in the shade. Had I anticipated waiting so long, I would have brought Bulldozer and his stroller with me, so he would only have to manage two kiddos, which was much more doable. Once we were able to order, our food took another 20 minutes before it was delivered to our table outside. Those who worked at Pizza Planet knew they had screwed up. To try to make up for things, they delivered all of our food to us at our table. They came to check on us several times. Everyone that met the kiddos fell in love with them. As an extra bonus the cast members threw in three extra gourmet cupcakes for the three older kiddos and something special for Sunshine. However, once again, they did not have it together when it came to the kiddos' special dietary needs, nor did they communicate that the cupcakes had orange flavored frosting with real citrus on them. Sure enough Bulldozer had an allergic reaction, which we luckily caught in time. We were able to treat with Benadryl, but again... I was NOT a happy person. 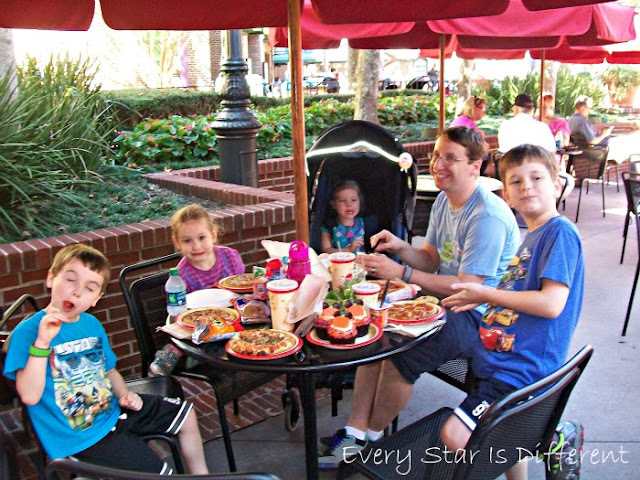 Oddly enough, the kiddos raved about their food from Pizza Planet. They loved it when it did come and ate a ton. The pizza was by far the best we had on our trip. It's pretty obvious to say we won't return there again because of all the other issues, but at least good food made up for something This picture was taken when we finally did get our food. By this time Princess wasn't doing well. And in her defense, the morning hadn't been the best. You can see Jason's sarcastic smile. Lol. Sunshine once again was being extremely difficult. From the moment she woke up in the morning, I knew she was going to have one of those days. Sigh. Jason and I knew the day couldn't continue as we had planned. All of the afternoon's plans were boy oriented. Princess wasn't excited about any of them. Sunshine wouldn't do well with any of them. Both girls were miserable. I had hoped over the course of the meal I would see behaviors turn around and I could take the girls to go see the Disney Junior-Live On Stage! and meet the Disney Junior Pals afterwards, while the boys did their thing, but the girls couldn't even pull off lunch. As we had planned our trip to Disney World, Jason and I knew there would probably be times when the girls wouldn't do well and we would need to return to the hotel with one or both of them. Jason volunteered for this responsibility, knowing he would probably need a break himself from the chaos of the parks. So, after lunch, after I convinced the girls it was best to go back to the hotel, and there were no more meltdowns, Jason took the girls. I remained in the park with the boys. Within minutes after Jason left, it dawned on me that I should have been the one to leave with the girls. If I was back at the hotel, I could do laundry, instead of having to stay up late. The girls and I could run some errands around the hotel etc. There was a chance I could have even taken them swimming. These were things the girls would never go for with Jason. I had no particular interest in seeing the shows and going on the rides lined up for the afternoon. Jason would have thoroughly enjoyed them. Sadly, I had no wi-fi signal to message Jason to tell him to meet and switch off. There are some parts of Disney World where the signal is great. In other areas, especially at our hotel and Hollywood Studios (in some parts), there's no signal at all. Sigh. Jason was able to relax in the room, eat snacks, watch football and Disney Junior channel with the girls, as they colored, read books, and used activities from their busy bags. Once the boys and I settled in for the afternoon, and Bulldozer's allergic reaction was treated, we had a very enjoyable time. Over and over again I was thankful that the girls were not with us. 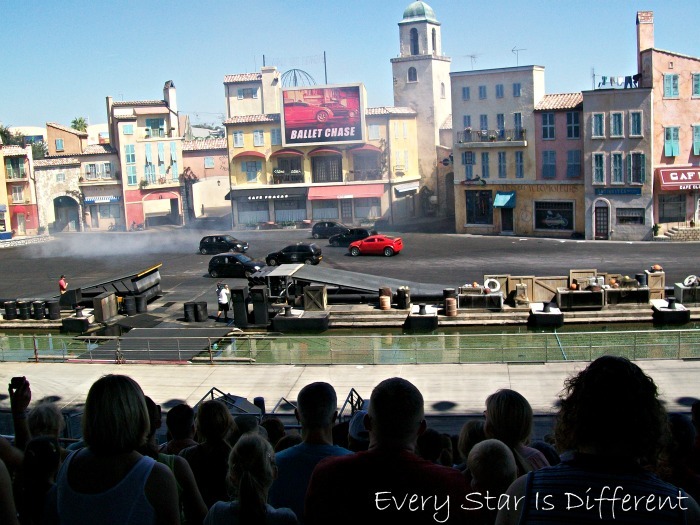 Our first show of the afternoon was Lights, Motors, Action! Extreme Stunt Show. The boys had watched the youtube video of the show at home and desperately wanted to see it. We did not have a fastpass for the show, but with our handicapped stroller marked as a wheel chair we were ushered through the fast pass line and taken to the elevator, and guided to where those in wheelchairs watch the show. The seats were great. I would definitely NOT have wanted to be closer to the action. 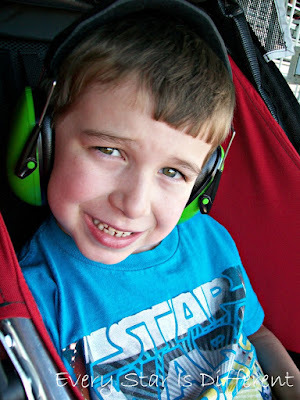 The boys happily put on their Snug Safe n Sound Kids Earmuffs / Hearing Protectors and were so excited for the show to start. The show was LOUD. It was SMELLY, like burning rubber smelly. There were gun fights, bad guys, good guys, etc. All of it was explained and clearly pretend, but the girls would definitely not have understood that in the moment. Fireworks and explosions are also part of this show. I admit, the show was great. It was so much more exciting seeing it in person than on youtube. Car chases are some of my favorite scenes in action movies (which I love), so it was fun to see how it all works. The boys had the time of their lives. Dinomite was in heaven, as he has always been a fan of cars. Bulldozer loved the explosions. I was super excited to capture a great shot at the end of the show. The boys love the picture, but they'll be the first to tell you that the explosion was LOUD and HOT. They definitely had quite the sensory experience and did amazingly well with it. I will no longer be worried about taking them to any type of car show, monster truck race, etc. There are so many new entertainment possibilities for them. It was not long ago that Dinomite would scream at the sound of a 4-wheeler. When Bulldozer was little he would cry every time he heard an airplane in the sky. They have grown up so much! Indiana Jones Epic Stunt Spectacular! 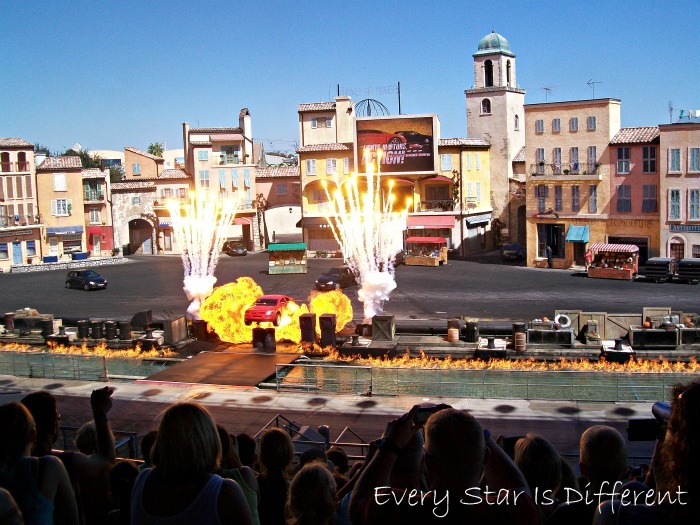 Next on our list of shows was the Indiana Jones Epic Stunt Spectacular! We did not have fastpasses for this show, and barely made it before it started, but we made it in time. (We had stopped for a potty break after the last show.) With our wheelchair tag, we were seated in the handicapped section. For this show this meant we were way up top in the back. Both boys, Dinomite especially, had been super excited to see this show. They had watched the youtube video of it at home as we prepared for our trip, and couldn't wait to see it live. Once again, I was so relieved that the girls weren't with us because the show was not appropriate for them. My plan wasn't to have them see it anyways, but it was nice to have a first viewing of it without them. The boys thought the show was awesome. I personally didn't think the Indiana Jones character did a good job as he wasn't in the right places at the right time for the stunts, but this could have been a result of where we were sitting too. Still, the boys had the time of their lives. 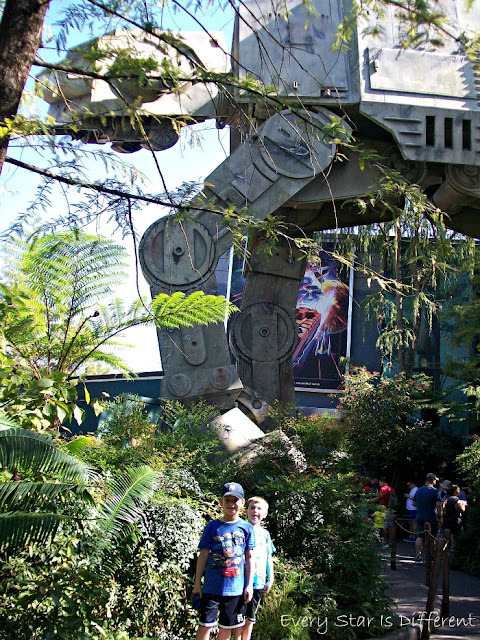 Next on our list of afternoon fun was Star Tours. This had been the ride Bulldozer had been waiting for all day. He is obsessed with everything Star Wars. While we waited for our fastpass time to come, we did a little shopping and Bulldozer requested a picture in front of the AT-AT. He was so excited about this! The ride itself was an adventure. Our fastpass combined with wheelchair access to the ride made our wait minimal. I was so thankful for being able to take the stroller with us in the line. Between Benadryl, heat, and sensory overload from the afternoon, Bulldozer could barely walk or talk on his own. This didn't stop him from having fun though. I am not a fan of anything in 3-D. It makes me so dizzy. This ride was entirely in 3-D. I was so nauseous by the time we were finished. Lol. "Bulldozer! You're the rebel!" all throughout the ride. Lol. After Star Tours, we headed back over to Toy Story Midway Mania to try again. Thankfully, it was working. The tickets they gave us helped us through the fastpass line. Our wheelchair tag, helped us go through the handicapped loading zone again. The only downside to the ride this time was that it was also in 3-D. My stomach was such a mess. This was the day I realized I'm getting old. I used to LOVE all of this stuff, and now... I'll happily sit on the sidelines with Sunshine. The boys had so much fun on the ride, and really enjoyed their afternoon. As we planned our itinerary for each day, I scheduled one show or ride per hour. My timing was perfect, leaving time for bathroom breaks, etc. Our day at Hollywood Studio was the tightest, because of back to back shows, but one event per hour is absolutely doable with special needs, etc., except for eating, which we learned to plan two hours for, no matter if it's quick service or table service. After Toy Story Midway Mania, the boys were ready to head back to the hotel. It was my hope that when we returned, Jason would head back to Hollywood Studios to enjoy the evening, but after a very rough last hour with Sunshine, he decided not to. Instead, he went to the food court to pick up everyone's dinner and brought it back to our room. After dinner, he took the boys swimming while I put the girls to bed early. Lastly, he did all the laundry for me. Just those little breaks without any of the kiddos made a world of difference for him, just as it had the last couple of days for me. All-Star Music Resort is more like a college campus than a hotel, so a chance to walk around by yourself does wonders! With all of that to do, we didn't make it to bed before 1 AM, but the boys were to bed by 10 PM and the girls were to bed by 8 PM. Despite such a horrible start to the day, Bulldozer still refers to this day at Hollywood Studios as his favorite because all of the action packed adventures. Dinomite enjoyed it as well. I don't think it would have mattered what we did that day as far as the girls were concerned, they were just having one of those days. Thankfully, we know every day is a new start, and there's always tomorrow. 1) Prepare your special needs children for unexpected changes while in Walt Disney World. You can never be 100% sure what you've planned will actually happen. 2) Asking for your stroller to be tagged as a wheelchair when you have special needs children at Disney World may just be the BIGGEST BLESSING while on your trip. 3) Prepare your special needs children for the possibility of rides breaking down. You can assure them IF the ride is fixed, you can go back when time allows. If not, they can choose something else they'd like to do. 4) Quick service meals with special dietary needs can be a nightmare and may take just as long as table service meals. Table service meals and/or bringing your own meals into the park may be a better choice. 5) Read EVERY label of EVERY food given to you at a quick service location, just in case those serving you missed something. 6) Always have a first aid kit with you with anything you may need on a moments notice for your special needs children, especially those with food allergies. 7) It is okay to leave the park for a break or rest when needed, especially with special needs children who aren't doing okay. 8) You may not have a wireless internet signal everywhere in Walt Disney World parks and resorts. Plan accordingly. 9) Be prepared for sensory experiences like you've not experienced before, bringing whatever sensory items you think you may need to help with noises, heat, smells, and more. 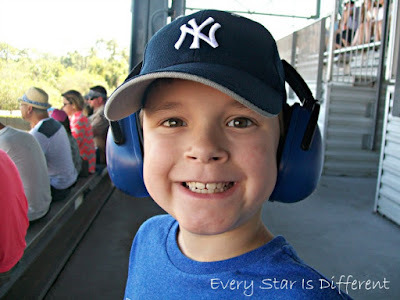 10) Watching youtube videos of shows before going to Disney World can help prepare your special needs children with what to expect and can help you determine if a show is appropriate for everyone or not. 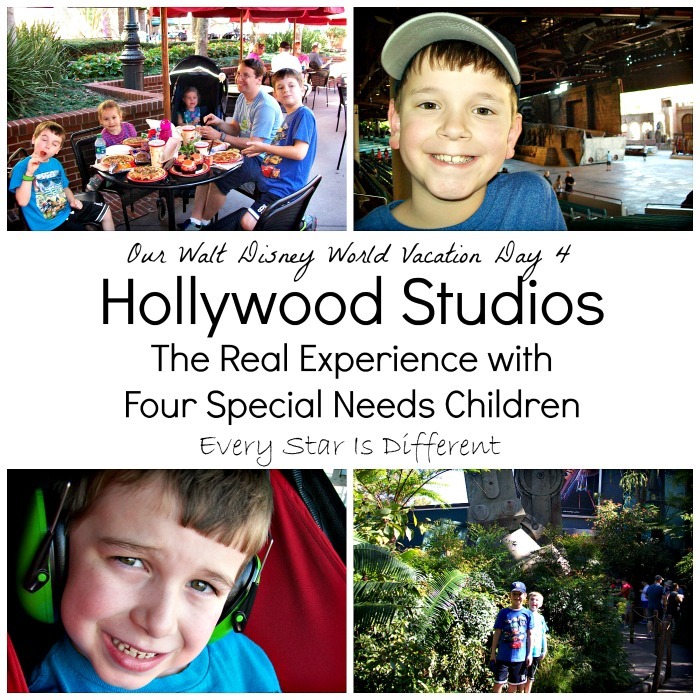 11) Scheduling one show or ride per hour during each day in the park is a great way to not over or under plan when you have special needs children, with the exception of meals. Those usually take about 2 hours each. 12) Plan for time to enjoy your hotel. 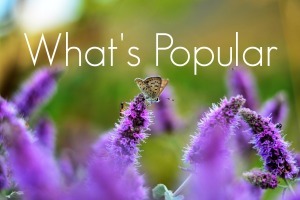 It can provide much needed rest and unwinding for adults and special needs children alike. 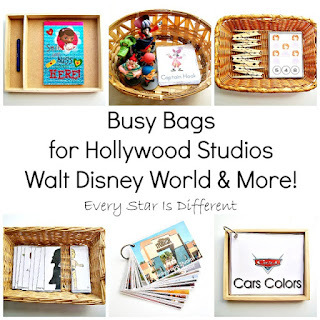 If you'd like to see the busy bags that helped Sunshine through her day at Hollywood Studios and then later in the hotel, be sure to check out this post! 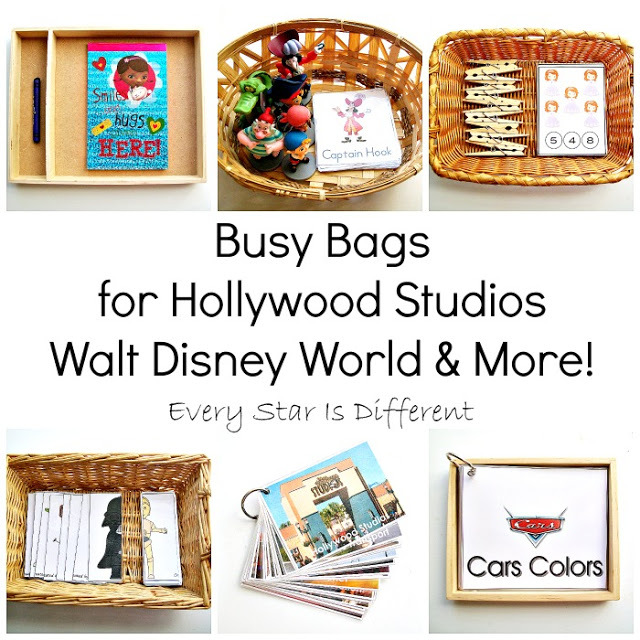 Busy Bags for Hollywood Studios Walt Disney World & More! For more lessons learned while on vacation at Walt Disney World, be sure to read the posts below!